HANAMI II: des récits mais aussi des trucs à savoir pour les OVNIs: OVNI 435 versus 445. I've read some of your posts on aluminum boats with a keen interest and was hoping you could give me some Ovni advice. Right now I'm looking at a 435 and I see that you have a 445. In your view, what sacrifices am I making by buying a 435 instead of a 445? A 445 is more expensive and could break my budget, so I was hoping some input on the difference between them could help me decide. The 435 and the 445 have a few differences which I'll try to summarize. The 435 is the older version of the 445, the previous one was the 43. The last 435 was built in 2009 and went to the Mediterranean. The 445 has more power as she has more canvas: the mast is higher and the sail plan is different. The architect are different, the 445 was designed by Marc Lombard who designed a few IMOCAs. The whole length of the hull in the water is for the 445 and is shorter on the 435. The 445 is higher than the 435 and protection is a bit better when in the cockpit. Both have a central dagger-board but the 435 is a simple aluminium plate when the 445's one is a real shaped steel one weighting half a ton. Hence the boat stability is different. On both the lifting mechanism is good but more recent on the 445 of course. When sailing windward (something gentlemen never do as the story goes ...) the 445 is more efficient. The inside is not much different either, even if the plans are not the same. The 435 used to be Jimmy Cornell's Aventura II I think, before he went to Allure/Garcia as relationships with Alubat weren't what he expected (This is what I was told). With this boat he circled the world 2 times I think and went to Antartica for the 2000 trip. There have been 39 OVNI 445 built so far (mine is number 8) and they are bit difficult to find. There are more 345 on the market and they are usually in good condition as people who sailed them kept them carefully and were not shy with maitenance (there are exceptions but very few). The price for a second hand 435 might be in the 200-300 K-Euros depending on the equipment. The price for a 445 will be around 330 K-Euros, depending on the equipment but there are very few on the market. 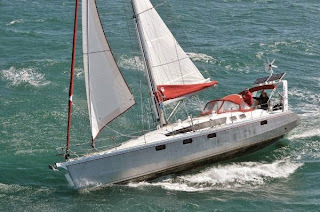 Alubat doesn't built the 435 any more but could build a 445 and that may be quite expensive BUT you can have the boat built to your requirements provided you know what you want and can travel to France often enough. It could be possible to have someone monitoring the work for you but I don't think you want to buy a new one. a couple of years ago and if they are back into business now it remains a bit difficult and very few new boats have been built, hence the price of second hand ones remains high. If not, feel free to ask and if you need a broker, tell me I know a couple of very good ones who are OVNI experts.